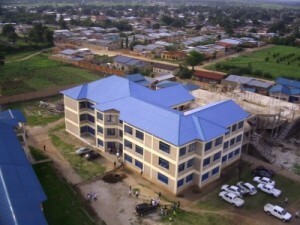 Hope Africa University (HAU), Kibuye Hope Hospital’s parent organization, is a Christian liberal arts university located in Bujumbura, the capital city of Burundi. Students at HAU gain a rounded education with a focus on strong Christian values and leadership abilities. The university aims to equip students for Christ’s redemptive work in the world, starting in Burundi. Burundi is one of the poorest counties in the world and is still struggling to recover from over thirty years of civil war and ethnic violence. Even as the country finds its political feet much of the infrastructure remains non-existent or badly in need of expansion and repair. As a result there is a desperate need for ethical professionals who can lead in their fields. HAU is preparing its students to be those professionals. This is especially true in HAU’s medical program, one of three medical schools operating in the country. Students from eight nearby countries are trained at HAU in medicine and come to Kibuye’s rural campus near Gitega, about eighty kilometers from HAU, to serve their residency. At Kibuye, the students work side by side with career doctors and visiting professionals and are trained hands-on in vital medical procedures. The medical professionals that graduate from Hope Africa University’s medical program are uniquely equipped to serve in leadership positions throughout the region. Their superior training, extensive hands on experience, interaction with a diverse international community and firm grounding in christian values help to prepare them to change the medical landscape of Burundi, central Africa and the world. Learn more about Hope Africa University’s unique context or Kibuye Hope Hospital.